This section covers the various forms of honours and distinctions awarded to the Regiment, and anniversaries, customs and alliances associated with them. Battle Honours are awarded officially to a regiment after it has played a conspicuous role in an action; the usual format is the name of the battle or the name of the place where the action took place, sometimes with the date added. Battalions are permitted to display their battle honours on their Colours and on their drums. Queen's Surreys battle honours are too numerous for all to be displayed in this way, so the principal honours have been selected. 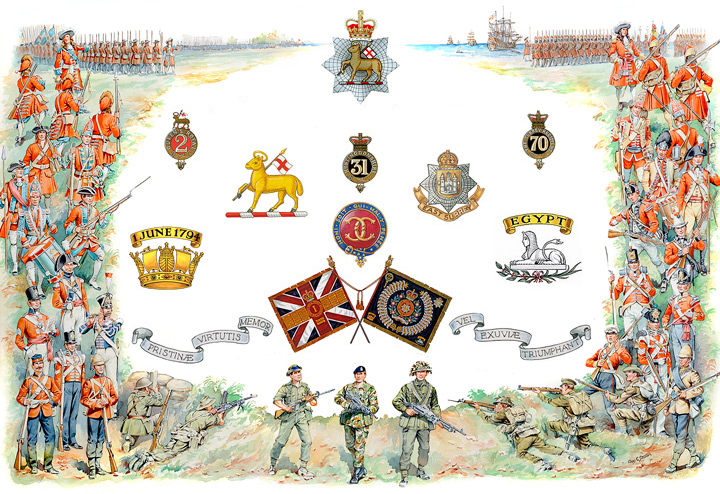 Distinctions are other designs carried on the Colours relating to honours awarded to the Regiment. Anniversaries are a list of the most significant events in the history of the Regiment; the most important of these are celebrated annually through the customs of Regimental Days. Other Regimental customs carry forward the traditions of the Regiment day-to-day. Civic Freedoms have their origins in ancient times, when most towns were enclosed by walls and gates, and the civic authorities viewed with alarm (often justified) the entry of bodies of armed men inside the gates. The award of the Freedom of a town to a regiment therefore became a mark of trust and honour, since it enabled the armed troops to come and go as they pleased. Nowadays, the award of a Freedom is entirely honorific but equally valued as a recognition of the part played by a regiment in local and national life, and of its relationship with the local community. Alliances are a recognition of the close relations which have grown between homeland regiments and their counterparts and comrades in Commonwealth countries.